As a nation, and the world, mourned the death of its beloved 35th President, John Fitzgerald Kennedy, the search for a suspect ended swiftly in Dallas, Texas. The Early Show co-anchor Harry Smith reports. With the arrest of Lee Harvey Oswald in a Texas movie theatre, it seemed the police had the prime suspect in the assassination of President John F. Kennedy. 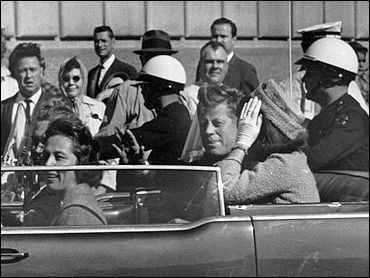 A rifle had been found on the sixth floor of the Texas School Book Depository, near a window overlooking the motorcade route - and that rifle had been connected to Oswald. He was asked by a reporter, "Did you kill the president?" He answered, "Haven't been charged with that." The district attorney announced, "It'll probably be the middle of next week before it goes to the grand jury." But Oswald would never face the charges, because on Nov. 24, 1963, two days after the president's assassination, Oswald was killed by nightclub owner Jack Ruby. But was Oswald the assassin? Did he act alone or were others involved? Why did Jack Ruby kill him? Was there a conspiracy? To answer these questions, President Lyndon Johnson created the Warren Commission on Nov. 29, 1963. Sen. Arlen Specter, R-Pa., who was an assistant counsel to the Warren Commission, says, "When we started this investigation, we were cautioned not to have any preconceptions. And that we had an obligation to keep an open mind, and to follow the evidence wherever it would lead." Oswald acted alone, firing three shots with a Mannlicher-Carcano rifle at the motorcade, from the sixth floor of the School Book Depository. The first bullet missed altogether; the second bullet struck both President Kennedy and Gov. John Connally; the third bullet, the fatal wound to Kennedy. Specter says, "My area of responsibility involved the ballistics, the wounds on the president and the wounds on the governor. I had the evidentiary corps, which led to the single-bullet conclusion." The single bullet - infamously renamed "the magic bullet" - passed through the president's neck, slammed into Governor John Connally's back, grazed his rib, then his wrist and finally lodged in his thigh. Specter notes, "Obviously, a curious course for a bullet, but we know the truth is sometimes stranger than fiction." And the fatal wound, Specter explains, "The bullet hole in the president's head, on the back of his neck, were round and regular. They had to come from the rear." But what about all the witnesses who talked about a puff of smoke from the motorcade's side? That's the infamous Grassy Knoll in Dallas is where shots other than Oswald's are said to have originated. Now, there also were theories about who was responsible: the KGB, Fidel Castro, even the FBI and CIA, and especially, organized crime. Was it possible that Jack Ruby, a low-level mafia figure, was ordered to silence Oswald? Not according to the Warren Report, which concluded Ruby killed Oswald to spare Jackie the ordeal of a trial. Richard Billings was the editor of the report issued in 1979 by the House Select Committee On Assassinations, convened to answer the unanswered question of a conspiracy. Of the sparing-Jackie-a-trial theory, Richard Billings says, "It's reported that he said that, The Warren Commission said he said that. Yeah, he said that. But nobody believes that today." Billings says he believes Ruby was ordered to get rid of Oswald by the people he worked for: organized crime. Billings says, "The House Committee basically agreed with the findings of The Warren Commission. But in one area, the acoustics evidence turned out to indicate within a 95 percent probability that there had been four shots." So if there is a fourth shot that means there's another shooter, Billings says, "That's what it means. Therefore, there was a conspiracy. " Billings says he thinks the mob was responsible for the assassination of the president. The motive, Billings says, is that "Kennedy was giving the large powerful members of organized crime a very difficult time." Asked if the government would reopen the investigation if there was any credence to any of these claims, Specter says, "If anything came to light, I'm sure that it would be reinvestigated with intensity." So would Oswald have been prosecutable? Specter says he would. "Oswald would have been prosecutable and would have been convicted." Specter points to the evidence: nobody questions that Lee Harvey Oswald worked at the School Book Depository and was seen in the building that day. The rifle is definitely Oswald's; the bullets were scientifically proven to come from the rifle; the magic bullet's crazy path and the direction (origination) of the fatal shot, both proven possible by more than a dozen pathologists over the years. What's missing? Concrete evidence to prove there was a conspiracy. Specter believes that people will continue to be skeptical and continue to ask questions - for years to come.